Ideal for soot, dust, laser toner and other fine particulate. Weighing just 4 pounds, the Atrix Express Plus is one of the lightest portable vacuums available. 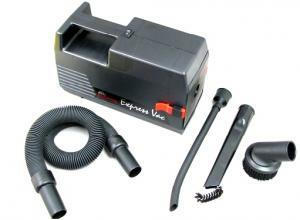 The Express Vacuum is easy to operate. The replacement cartridge filters install with a snap and without mess. Atrix has built in a new, powerful motor making the Express Plus as powerful as most of the larger service vacuums.